A complete solution of secure smart card IDs and credentials in a variety of form factors for physical and logical access control as well as converged solutions for building and computer access, transit payment, cashless vending, biometrics and other applications. Proven, Reliable Technology - Offers extremely consistent read range. Unaffected by body shielding or variable environmental conditions, even when close to keys and coins. Convenient To Use - Can fit into a wallet or purse. Use with a strap and clip as a photo ID badge. Cross-reference - A cross-reference list correlating the external card number and the programmed ID number is provided for easy system administration. Security - Offers over 137 billion unique codes. Long Life - Passive, no-battery design allows for an infinite number of reads. Durability - Strong, flexible and resistant to cracking and breaking. 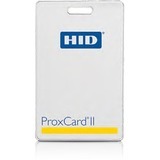 The RF-programmable ProxCard® II proximity access card is the industry choice for a cost-effective solution to proximity access control.